We ask three primary questions; the quoted text in parentheses corresponds to chart labels that appear later this this report. Other than sizable increases in Priority and Focus for AI, the 2018 graph is visually similar to 2017. Subsequent sections examine results more numerically but for a big picture view, I find it helpful to compare by eye for the overall pattern. We find it instructive to examine the gap between Priority and Focus. 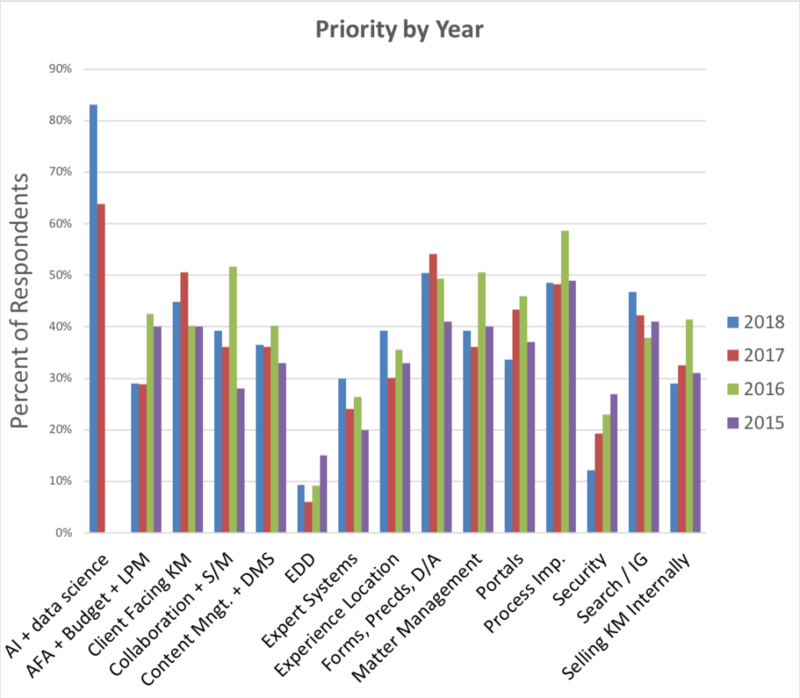 Recall that Priority refers to 2018 priority intent and that Focus refers to what respondents actually worked on in 2017. The gap reflects shifting attention from last year to this year. Positive numbers mean more intended attention in 2018 than actual focus in 2017. Negative numbers mean less intended 2018 attention than 2017 focus. 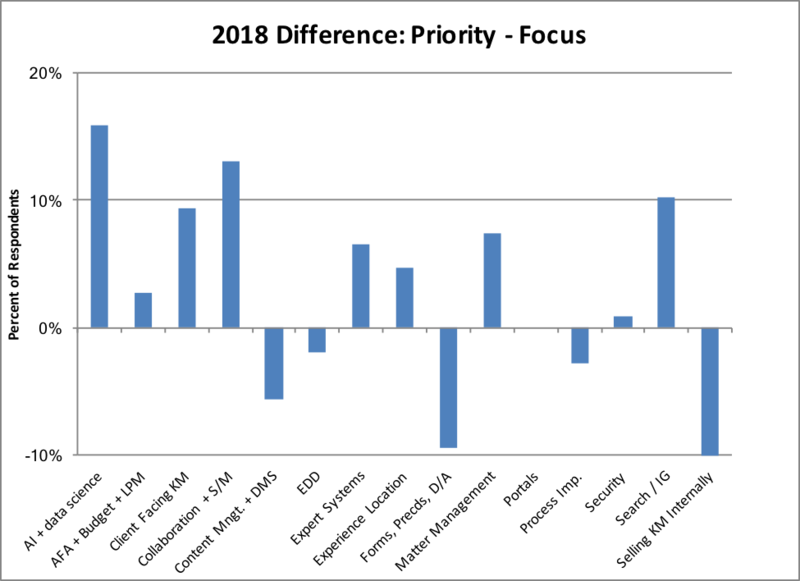 The difference between the percentages for Priority and Focus remain modest, as they did last year. I will focus on a few of the bigger gaps, offering my hypotheses to explain them. AI shows the biggest jump in attention – not a surprise given the hype in 2017. The next biggest jump is for collaboration and social media. I believe this reflects the growing legal market attention on collaboration products such as Slack. At least two legal specific products offer comparable features. Plus, Microsoft has released Teams to compete with Slack. Teams appeals to most law firms, which have enterprise Microsoft licenses that make Teams free or low cost. Anecdotally, in my consulting practice, I hear increased interest in this product category. This may also be “back to the future”. About six years ago, many KM professionals and firms piloted social products. That was not a happy chapter – after some initial uptake in some firms, systems feel into disuse. Search and information governance shows a modest jump. I am surprised it is not bigger given major shifts in the product landscape. I find the drop, albeit relatively small, in attention for content management and document management systems surprising, again because of major shifts in the product landscape. 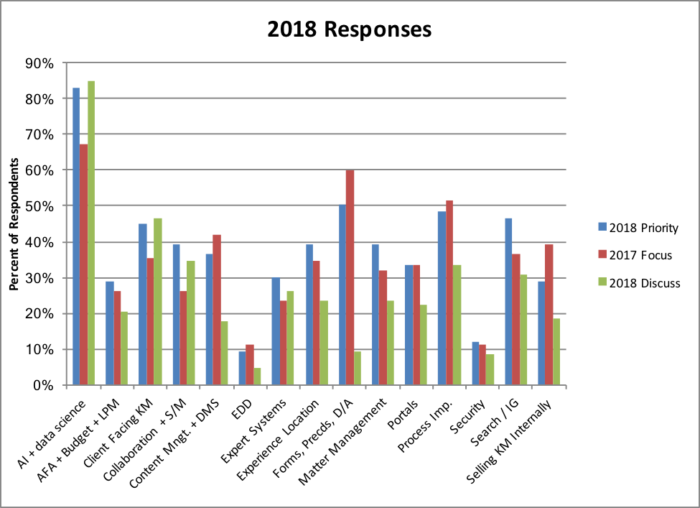 One hypothesis is that KM professionals spent significant time in 2017 planning for changes to the DMS and therefore do not need to spend as much time on it in 2017. For the record, I said something similar last year! So, take my hypothesis with a grain of salt. I hope that this does not reflect KM ignoring DMS while IT takes the lead in firms upgrading or migrating DMS. The new generation of DMS offer a rare chance to address adoption, but only if folder / workspace design comports with how lawyers actually work. KM is much better positioned to get that right than IT. I lack a good explanation for why attention to selling KM internally has dropped. Working on adoption of KM (and legal tech) is a perennial task. I have not seen evidence of sudden, widespread KM uptake, so I doubt that remarkably effective sales efforts in 2017 explain this. Perhaps this reflects recognition that forcing KM on lawyers fails and the better strategy is to focus KM efforts where lawyers most want it. The chart below shows how priorities have shifted over time. In the text below the chart, I discuss tags with more than a 10-percentage point shift versus last year. Priorities for 2018 largely mirror those for 2017. Only one tag saw a shift of more than 10-percentage points in either direction: artificial intelligence up 19 points. AI remains hot. Last year, the first year we asked, 64% of respondents listed AI as a priority. The twenty-point jump to 83% this year is no surprise – as noted above, the 2017 hype was extraordinary. Many large firm management committees discussed AI. Numerous firms licensed AI or machine learning products. No surprise here. The next biggest shift was a 10-point drop in Portals. I find that surprising because I know from my consulting practice and conferences, many firms are re-thinking their portals. There has been significant interest and action in moving from portals focused on administration to ones focused on law practice and on managing clients and matters. Perhaps the explanation of the drop is that many firms substantially re-designed portals in 2017 (and 2016). The drop could reflect “job done”. 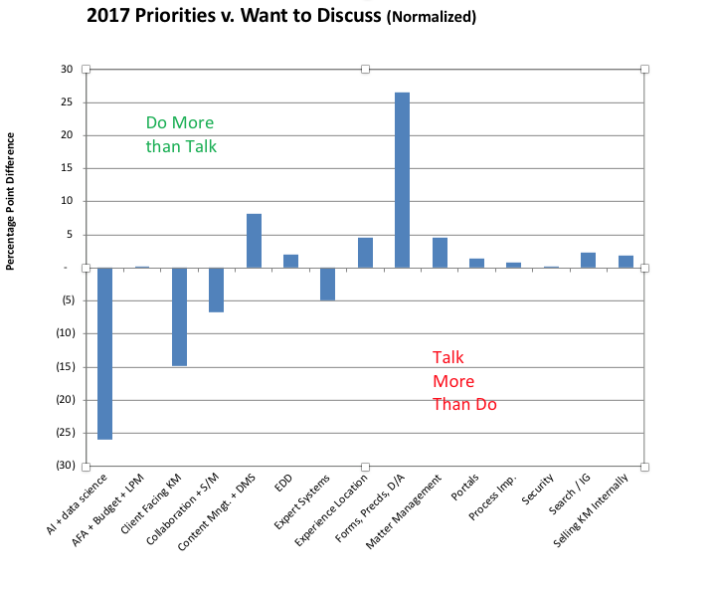 Each year we also compare respondents’ priorities (“Do”) with what they would like to discuss (“Talk”). The chart below shows this comparison (normalized by the number of tags/respondent, which yields a 71% multiplicative adjustment factor). The variance between Do and Talk is relatively small for most tags. There are two big gaps, one in each direction. Consistent with other results, everyone wants to discuss AI to keep up with the market, even if not everyone will have the budget or time to do it. And forms and precedents show a big gap in the other direction. Forms are a mature topic so I am not surprised interest in talking about it falls below its priority level. 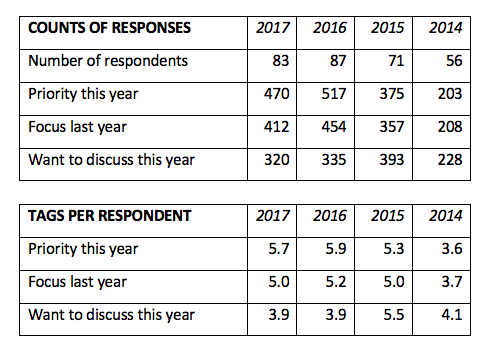 I draw two main conclusions from the survey, the same as last year. First, KM remains robust. 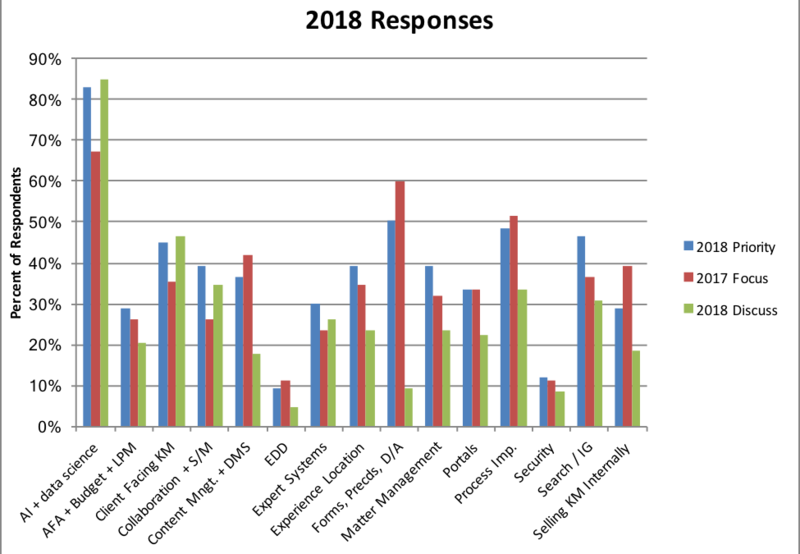 Each year we find more firms with KM professionals; the number of survey respondents and Summit attendees grows. Second, KM has certain core activities but also tackles an ever-changing set of initiatives. KM professionals will likely always need to attend to core activities such as forms + precedents or upgrading core systems such as search. But they also work on a shifting range of activities, from pricing, and process improvement, to new methods of collaboration. Of course, the latest is artificial intelligence, which seems destined to occupy us and many others for years to come. Too few legal market surveys clearly specify respondent demographics or explain potential limitations in interpreting results. I therefore share here survey details. Firm Sizes and Locations: Most respondents work at firms with 500 or more lawyers in the US, Canada, or the UK. Survey Not Representative of Market. We survey large law firms where we have identified senior KM professionals. The survey therefore selects for firms with a KM commitment. We believe its results reflect the direction of KM for such firms. The survey says nothing about firms that have yet to invest meaningfully in KM. Security / access management / info. gov. Question Changes in 2017. This survey added one new question versus the prior three years: AI or data science. And it consolidated two prior year tags, social media and collaboration, into just the latter.